I have long had a fascination with the older Wusthof French knives. There were only one of a few production companies that made a French knife with a truly triangular blade. While the functionality of this style blade is not that much different than other forms of the Classic French knife...it speaks to the roots of the French knife in general and for this I enjoy exploring these styles of blades both in study, in my bladesmithing practice and applied in the kitchen. I am excited about this post for several reasons. The first of which is a long held interest in classic chef knives. Some of the finest made came out of the French and German Shops of Sabatier and Wusthof respectively. There was an era of full size chef knives that were created with very (or very close to) triangular blades on their French knives. This style blade was an adaptation of some of the early styles of French knives with a high tip, straight back and curved belly. In the iterations to follow, we see a significant flattening of the belly and the movement of the tip to mid-line of the blade. Most classic French knives are created withthe tip being centered to the blade. This may possibly have been, in response to an evolution of styles in food preparation; where time factors became more essential, the speed in slicing that is expedited by having less belly and more of a straightness to the cutting edge playing a role in this for sure. And.......... While these are just my opinions from study, it makes a lot of sense. Add to that, we are still seeing this today. Many custom makers are once again, creating blades with lesser belly. You generally see this in many full size working knives created today by certain makers who produce chef knives with modern flair. The culinary styles in out modern professional kitchens of today see more "push-cuts" being employed versus the traditional style of the anchored-tip and rocking style cuts of the classic European and French era. Time remains of the essence in any kitchen...and even more-so these days. And though some may tend to work in this way, there is still and always be a place for the older style knives. The second reason I have been inspired to revisit this style of knife is due to a new friend and fellow chef knife maker named Don Nguyen. Don's knives are truly fantastic and so much so, that I recently bought two of them to use in my own kitchen. And as with all the knives I buy, whether they were made in the mid 1800's or in the 1940's or in the last few decades, or today, I get really excited to use these knives and also adapt some of the elements of their design in my own bladesmithing practices. One of the two knives I got from Don N. is named named Zerzura, named after the mythic white city oasis of Northern Africa. Zerzura is both very modern and with a triangular blade of Japanese steel. This knife inspired me again about this style of blade! ....but first…..a few shots of an older sketch when I was looking at lots of the older French Knives from the 1920's-1940's, and decided to forge my version of that style of blade. Looking at it now...it's no so triangular:) Also, an image of two knives inspired by the early French knives with the high tip, the knife on the bottom in the image of two knives with tribal wrapped handles. Thanks for taking a look at my work and also for taking a look at some of Don Nguyen’s creations as well. Classic Wusthof French Knives with the triangular blade. The Blade above is forged out of 3/16" 1095. It is still in process, but I am truly excited about this knife. Stay tuned to see more images as I move along in the process! 2017 has been a great year! There are some new models coming out of the studio that I am gravitating towards making more of. The Japanese Kiritsuke Style Chef Knife Blade is one that has always been eye-catching to me and one that I appreciate for it's sharp lines and overall aesthetics. It also happens to be a very useful style in many applications. I have taken this style and made it my own...so to speak. The first time I was inspired by this was in the creation of the Kiritsuke Utility. Then I went on to create the Kiritsuke Chef and also my version of the full size Kitistuke all of thee in stick tang builds. The first image shows the most recent pair of Prototypes I have completed of the Model; I will be calling this one, the Kiritsuke Chef. Smaller than a general purpose Kitsuke (which generally are created with blade lengths of 8 inches or so) it is a really fantastic size for daily meal preparation. I was blessed to have this fine image taken by Caleb Royer Photography and what a fine job he did! The Kirisuke Chef is a super functional knife in a very handy size. 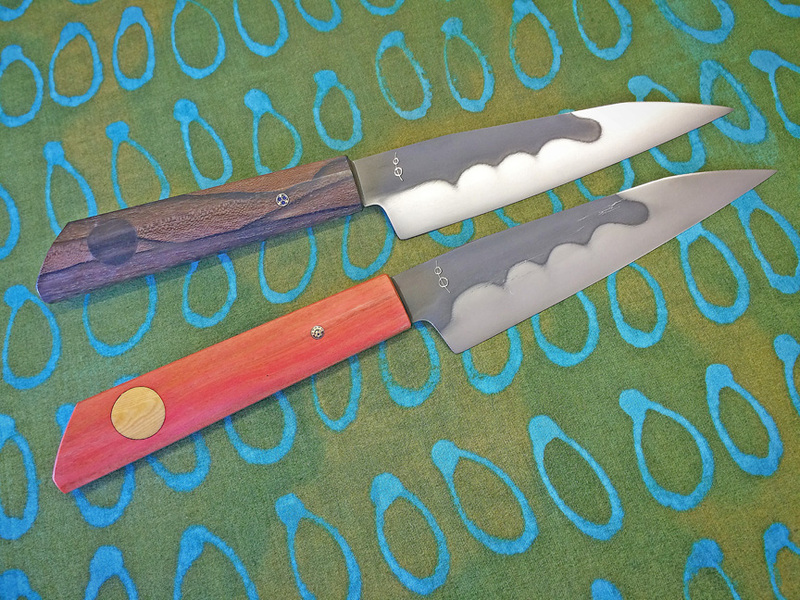 The two prototypes exhibit blades that are just shy of 7" at 6 & 7/8" with an OAL of 13 & 1/8" A perfect size for both the home, catering, or commercial kitchen. The Kiristuke Utility will also be a knife I will be creating more of. It's seeming simplicity is not to be overlooked as it is highly functional and a very fun knife to use; handy in any kitchen for detail work where a knife larger than a paring or petty is required. It would also be a fantastic line knife as well. The Kiristuke Utility exhibits a blade that is 5.75" with the OAL being around 11.75, and a heel width of 1.29" Not quite enough for tons of room for knuckle clearance over the cutting board, but also very generous for a utility knife. With a nimble yet strong tip, it is a great detail/utility knife with lots of character! Finally the Full Size Kiritsuke. There has only been one made so far and it sold so quickly I hardly had time to measure it, but I know the blade on this knife is coming in at 8.75" and an OAL of 14". All Models of Kiritsuke I am creating are generous in the handle length as this balances this blade style very well both functionally and aesthetically. I did a few smaller renditions of the same blade style, The images of the Two Rainbow Quenched Kiritsuke, has one in a slightly larger size with a 6" blade compared to the Mini Kiritsukewith the hamon that exhibits a blade of around 5.5". Also in the slide show below is a Kiritsuke Utility in comparison to my Classic French Utility and a shot of the Kiritsuke & Veggie Cleaver Set I create this year. That image the smallest Mini Kiritsuke in Bacote and antique Ivory Micarta, is posed with another fun little Alsace style knife that there will be more of as well. Very Handy and fun to use all of them! Thanks for reading and I hope you enjoy the images! I want to thank all my customers and collectors for your appreciation and support of my work over the years. It's been just over ten years that I have been making knives full time and what a true blessing it has been! Many of you who visit California Custom Knives regularly, have perhaps wondered, where much of my work has been going, in that, I have not had much for sale on my own website. The majority of my work is going to Eatingtools.com on New York. Abe Shaw has been a fantastic friend and business partner for many years, and he is representing my work diligently and with lots of love and support in educating others about the work I do. So I invite you to go there to see what I have available, and below in the image you will find the promo code to get a discount on a selection of knives I have currently available. Thank you All again for your kindness and communications, orders and friendships! Many Blessings of Health and Goodness to You All for 2017 !!! I welcome and encourage you all to come visit the California Custom Knife Show this coming weekend in Garden Grove Anaheim South. I will have a great selection of kitchen and some camp knives as well. 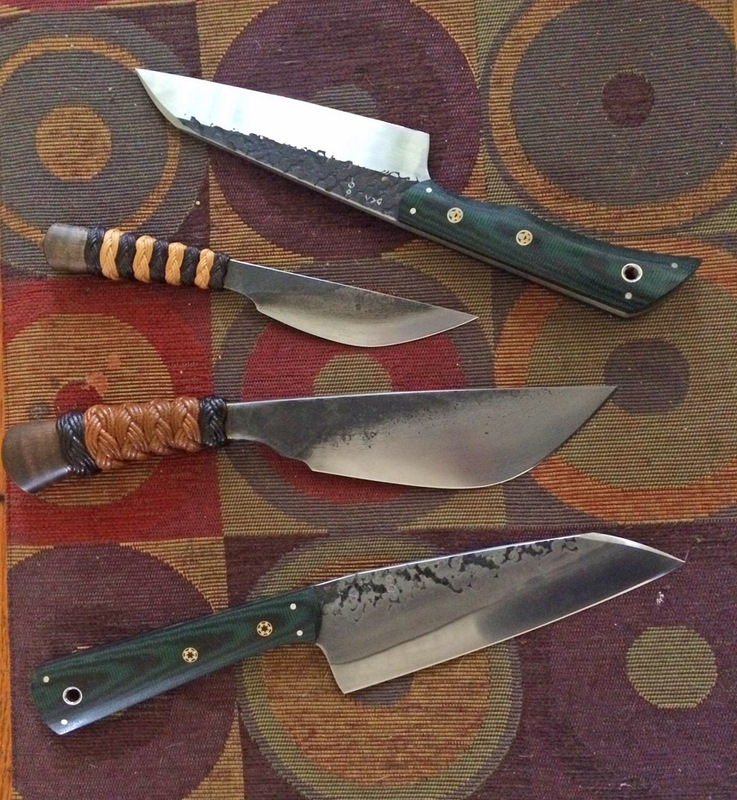 Below are a few images of some of the knives I will have on my table this year. I am excited about where things take me in the realms of my own craft. that learning these skills just seem like waste of time, or something like that. So What is "Precision Forged" ? Just what it says. Most of the precision forged applications have been relegated to high end industry aerospace products car mechanics in the creation of motor parts etc. It's interesting that forged blades sometimes get a bad wrap form the metallurgy community. Most of what gets said revolved around the crystalline structure and general science about metallurgy relating to structure & carbides and less-so concerning "grain-flow" in steel. ....Metallurgy geeks can laugh at me now if you like....however, I certainly do not claim to be an expert, but have certainly studied and continue to. you will find that, it's the things that are under the most stresses and heat tolerances in almost any application, that ARE being forged in one way or another. Fast forward to my own little world of bladesmithing. 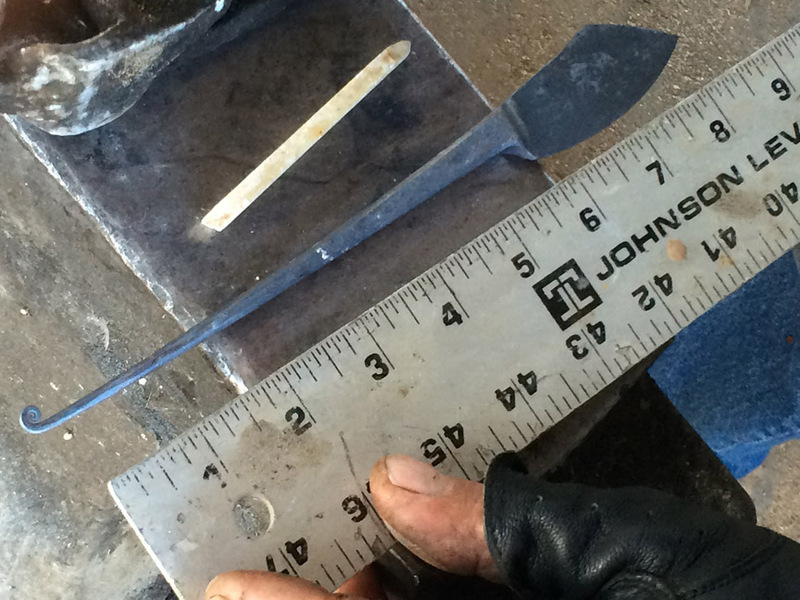 what does it mean to make a precision forged knife blade? Well...again it's nothing new. Been done for hundreds of years. BUT this does not mean it's easy. So....I have actually been doing it for a little while now. I did this mostly because for 7-years i did not have a grinder, so needed to get the knives very close to finished with forge hammer and anvil, then stock reduction with files. Whether its an integral knife forged out of round or square bar (which was all I did for the first 4-years making...mostly because I love integral knives) it takes time and skill. Most stick tang blades over 7" that will go for HT with hamon or otherwise (being slightly thicker at the end of forging) in my studio generally about 1-hour and 20-min at the forge to get right. A "Precision Forged" blade such as the one you will see below tacks on another 20-min to half hour to the above time at the forge. ...other than the clean forging, it is the Heat Treatment that is the bugger. Quenching thin blades with complex wedge-shaped geometry is a kick in the pants to say it lightly. Keeping things straight, hoping they do not crack when doing any of the subtle straightening that will need to take place in the few seconds you have as the structures begin to set-up and as the blade cools down is a practice all it's own. Anyhow, it's something I am playing with and plan to do more of. Essentially I used no power tools on this knife save for a bit on the handle. Which is a mortised construct of rare Westinghouse round and laminated Wenge with rosin impregnated woven cotton libe...my "Tribal Wrap" treatment. 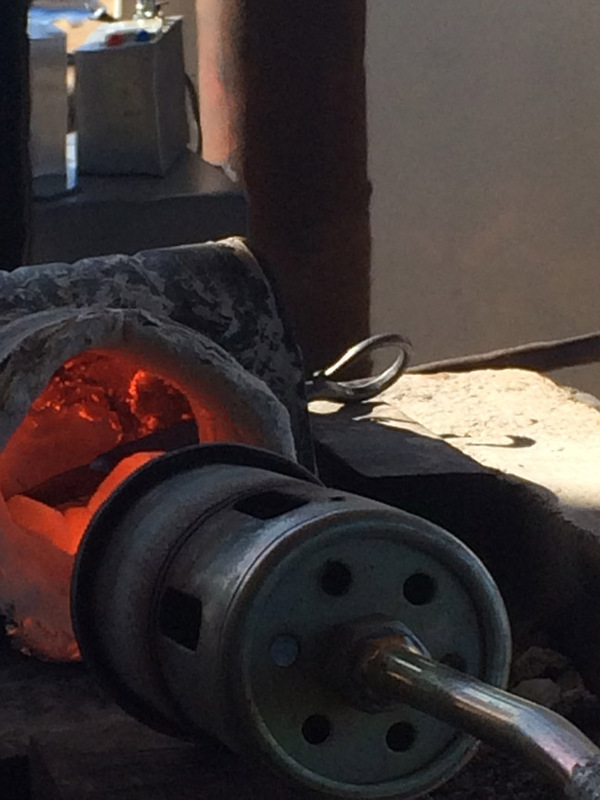 The blade was forged right to shape, thermal-cycled and heat treated and tempered. The final edge geometry was rolled-in a bit holding a stone like a file and then sanded and polished. Come by and check it out if you like. Thanks for taking a look and for reading all my post. p.s. the little red-line near the blade edge is a shadow/reflection of a priority mail box I was using as a reflector to take these images. Here are a two that are recently out of the studio. The two Shallot Knives I forged and heat treated about 6-months ago and was just getting around to them now. 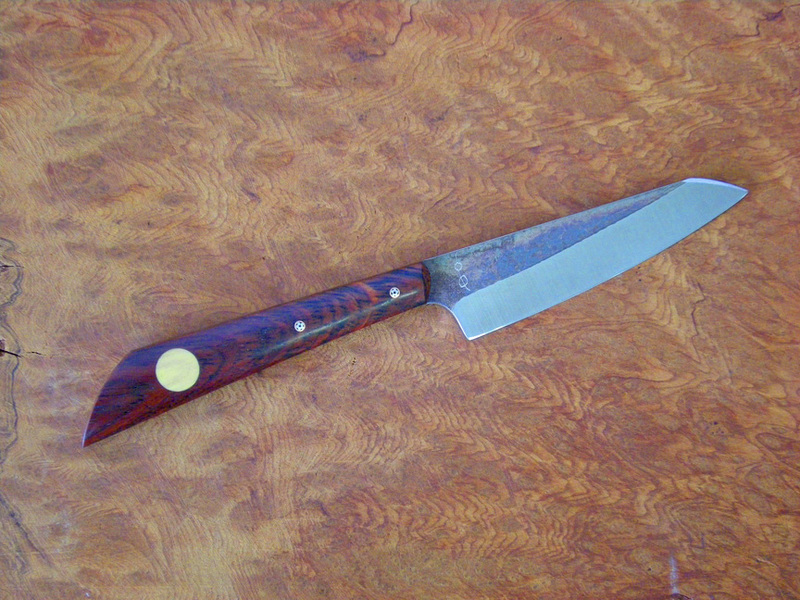 Here you see a regular Shallot Knife < Click the link to read how the Shallot Knife Design originated some years ago. And then Here is a one-off XXL Shallot. This XXL version having a particularly sweet differential Rainbow Quench! The regular featuring antique ivory Micarta with rare Westinghouse Blue Ivorite Micarta inlay over a blind pin and detail carving. The XXL featuring the rarest of the rare Westinghouse material, some glass epoxy Micarta that they only did one run of ever. It flashes some bright toxic green in the layers that is best seen in the sun, and almost impossible ot get in images. This one with Translucent G10 inlay over a blind pin and detail caving as well. I hope you enjoy seeing these two. Most recent listed first, oldest last. About mid way, I had a fellow chef Henry, ask me to create a veggie cleaver for him that was weighted more like a main working knife. I thought this was a good idea, and forged him one out of some thick W2. I now create my veggie cleavers with more blade-weight than most you see out there. such as cabbages, carrots, fennel,etc...can tend to be fairly robust, and the heavier blade is a positive in my opinion. This latest one, and first up, I am really proud of. It is a presentation piece, going to a local chef, custom ordered for him by the owners of the Cass House Grill in Cauycos California. The images really do not do this one justice, and I hope you enjoy seeing it. ....Blessed to have some of my knives in the hands of an amazing world class chef! 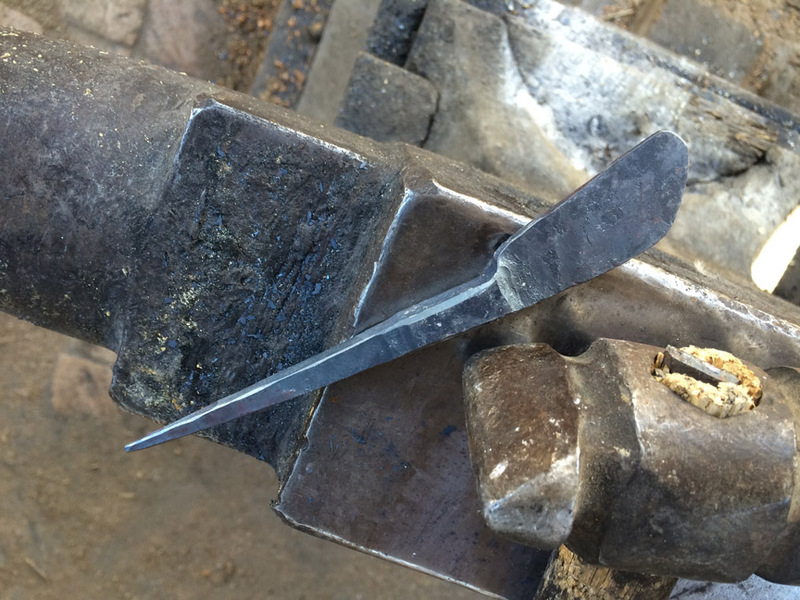 and the one that started the idea of forging them a little bit thicker and weighted as a main working knife. I'm proud to have his one living and being well used in the kitchen of Nita and David Broadwell. And finally, this one I created for Chef John Blevins of the Clove and Hoof in S.F. The only Full Tang Veggie Cleaver I have made to date. This on created in 2012, and with a wicked rainbow quench and tiger-stripes in the zone! I have been working on this project and will continue to for some time. It is taking time, as detailed information about these knives is somewhat difficult to find, because they were often created by illiterate smiths in very small shops.. I really wanted my version of these knives to be interesting and modern, yet faithful to the overall aesthetic and feel of the originals. This style handle dates most likely to sometime in the early 20th Century France. Knives of similar design can be found in French paintings dating back to the Middle Ages in the Alsace region of France. 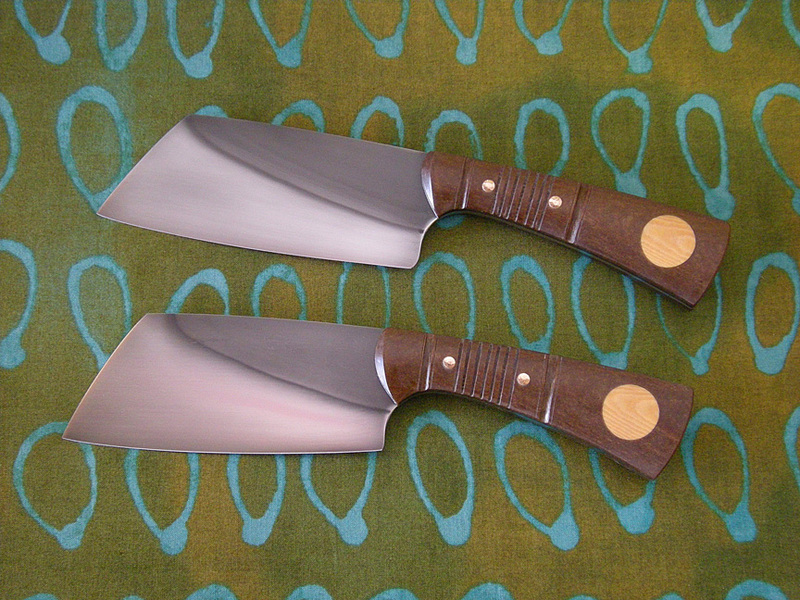 And more often than not were seen on butcher knives of various sizes, but with similar blade styles throughout. I created one fancy utility I called French Flower Utility two years ago, and now have finished these three. The top knife is going to a donation for an outdoors school in my area called Outside Now. The French version and bottom Utility are available now on my website for anyone interested. One of the main things I wanted to do with this style handle, was to see how it would adapt to a French Knife Blade Pattern. I did this on the middle knife and it really is a sweet-one! I have two more on the bench one of which will be finished in the next few weeks. It's interesting, because this style handle was a very simple slot construction done mostly by simple smiths starting in the early part of the 20th century in Alcase France. ....and as I can do so well, I have figured out how to make it more challenging, by creating these with a stick tang configuration with the front part of the blade actually registering into the handle. The originals were in a way registered…so this too remains somewhat faithful to this old design. (would have been three birds-eye rivets, or washer with peened pins over them in the past) and registering the entire choil-area into the handle. I hope you enjoy seeing these new ones and at the end of the post the one I did two years ago. More will certainly be made, and some adaptations to blade styles will emerge. Thanks for looking and Enjoy the images. P.S. Currently there is the French Knife still available in the SHOP Page of this website. Greetings Everybody, This year started off with a trip to Arizona in January, just after New Years, I headed out for two weeks, and then, a return trip in Late February. My plans were to visit the Wertz Family Gourd Farm, and Shop of Travis Wuertz,... home of the TW-90 grinder; and then head South to my Bladesmithing Mentor Tai Goo, spending time with him, his wife Julie, do some forging and camping, and met some of his family who were coming to visit, including his new-born baby grandson. As some of you may know Tai Goo and I have been working together for 10-years now. Neither of us can hardly believe that ten-years have passed since my first visit out there to learn bladesmithing and to forge my first knife in 2006. For those of you who do not know, Tai Goo is a Master Metalsmith; meaning that, his knowledge base is more complete than a blacksmith/bladesmith. 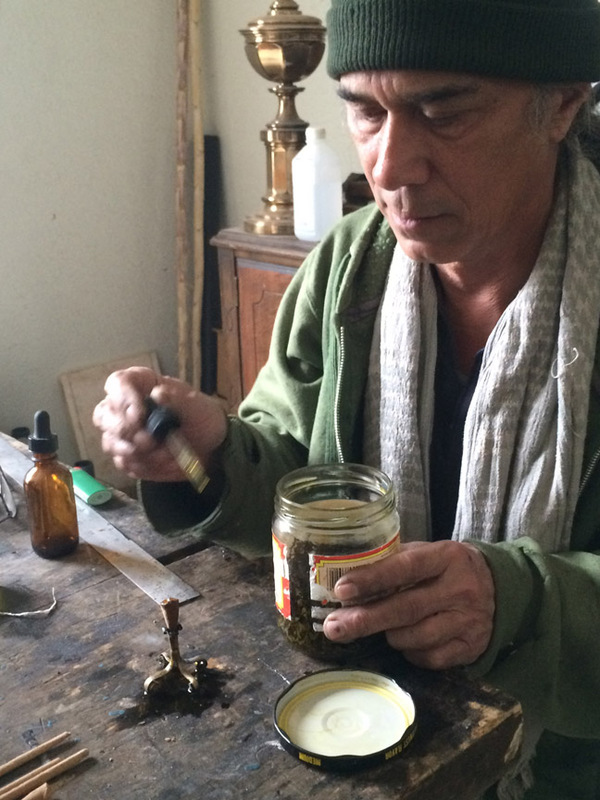 Holding an MFA and trained as a jeweler, Tai understands & offers so much more than I could have ever expected. My background in casting metals and working as a sculptor, blends with his interests and practices in the non-ferrous and ferrous realms, in a really amazing way. Plus we both enjoy music and cooking and we share a common interests in philosophy of life, religion, spirituality, art, and knives. So when we spend time together, it's truly a full experience of connection and life. First stop on this trip, the Shop of Travis Wuertz, creator of the TW-90 grinder! Travis is truly a guy who many consider to be genius, and rightly-so. Travis is one of the most intelligent, generous and creative people I have ever known. His demeanor is caring and technical in the ways that I have never experienced in another person, and he also is an accomplished knifemaker/bladesmith & craftsman. I went there to learn more about how to use the TW-90, focusing on the surface-grinding attachment for the most-part. Below are images of the Wuertz Shop visit. I stayed for about 4-days to learn more about the TW-90 Surface Grinding Attachment, and then after my visit with Tai, went back to do one more day to be sure I had the calculations and techniques in my head....... Spending some time, learning, evolving my craft. In these images you will see a few shots of the shop; see Travis doing one his many tasks, connecting with customers via phone. Moving from one thing to the next, welding, teaching me, instructing his new employees, Travis is an energetic ball of fire! Ernie is one of the TW-90 production crew members; a valuable employee of the TW-90 team, seen here doing the task of setting very powerful magnets into their frames...a tricky and difficult job. Outside, the scenery around the shop is wonderful. I met Brad the cat & we became new friends. And of course, there were gourds and sheep. Casa Grande is a beautiful part of Arizona Surrounded by mountains, and felt really cool and crisp while I was there; in fact, it rained quite a bit on that first trip out. Next stop is about as opposite of a world form the Wuerts Shop than any of you could imagine. I was so excited to arrive at my good friend and Mentor Tai Goo and his wife Julie's home. Tai and I have been looking forward to getting together for some time, and this was a really special trip, because we really had no plans, but wanted to hang out & figured that we would for sure do some blademsithing and cooking, but mostly really just wanted to visit, and relax. Tai and Julie were expecting family to arrive in two days, Julie's daughter was bringing her new baby boy, their 1-month-old grandson to visit for the first time, Tai's Daughter and his grand daughter who was so excited to meet her new nephew were coming over, what a lovely time with family!.......so we spent plenty of time cooking, relaxing and did manage to squeeze in some forging as well. 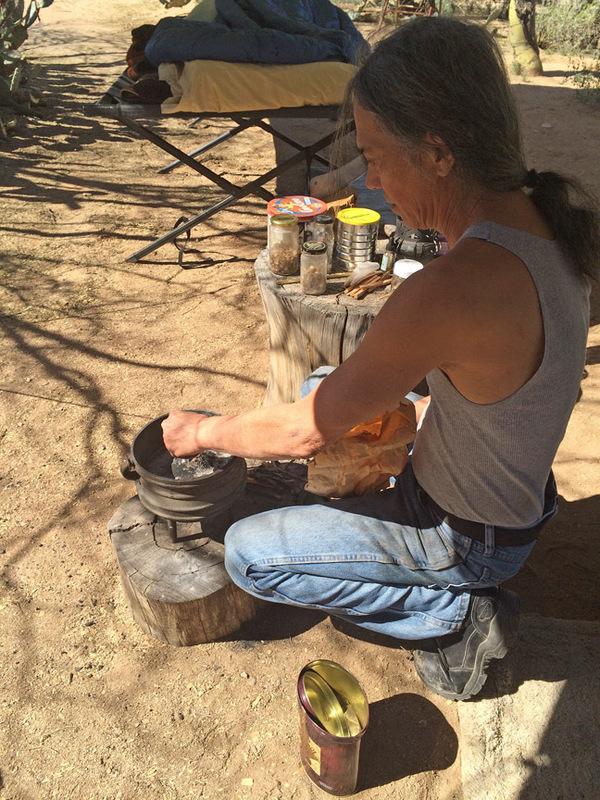 Tai has an amazingly simple studio, mostly all hand tools in his outdoor smithy, and next to it, a totally sweet camp-set-up, complete with outdoor kitchen! We had a blast to say the least. Tai had some pozole soup going when I showed up, I had some corn bread and veggies to add to the mix.......so that first meal we had was amazingly awesome! AND..... We enjoyed that pozole, and a fresh batch of cornbread, the next day while playing some of the records they had, many of the great vinyl that we all miss so much. 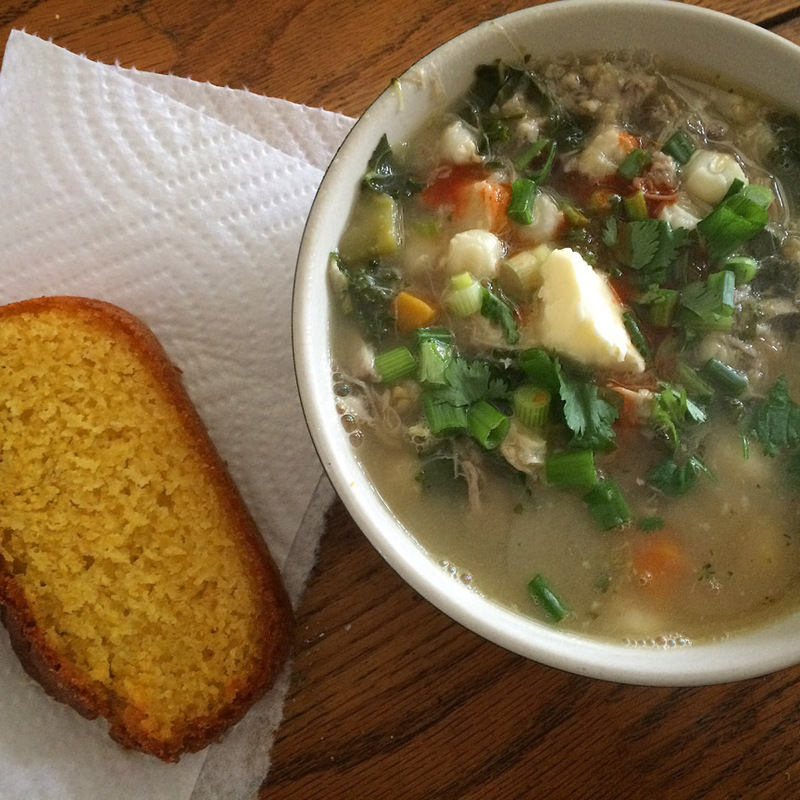 Leadbelly, pork-shank pozole and cornbread...what more could you want?! Tai showed me some of the local cactus fruits off the barrel cactus, the seeds of which are super-nutritious, full of protein and minerals, the flesh of which is a bit lemony tasting...... and SO...... I had the idea of making some honey butter with the seeds and a bit of the lemony-tasting-flesh from that fruit to smear on the cornbread! It was brilliant if I say-so-myself. Later that night for the family, we made steamed rice, and from scratch made sweet & sour pork with some fried broccoli to boot! When we did get down to forging, Tai introduced me to some new, and highly refined blacksmith-knives he had been working on. He made me one called a "Bush-Bug" forged out of .75" round W2, and really wanted to show me how they forged-out, and we got down to forging one. 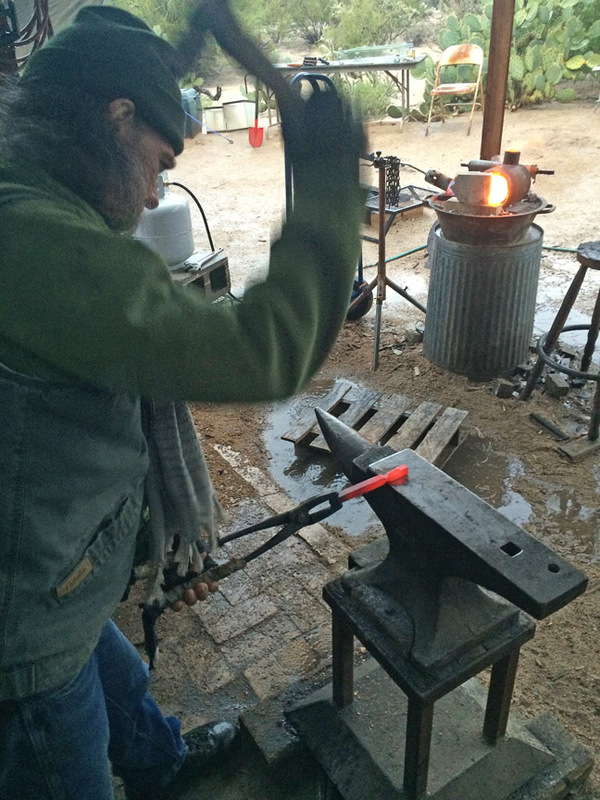 Enjoying some time in the studio while it rained outside, only the sound of the forge, rain and hammer. 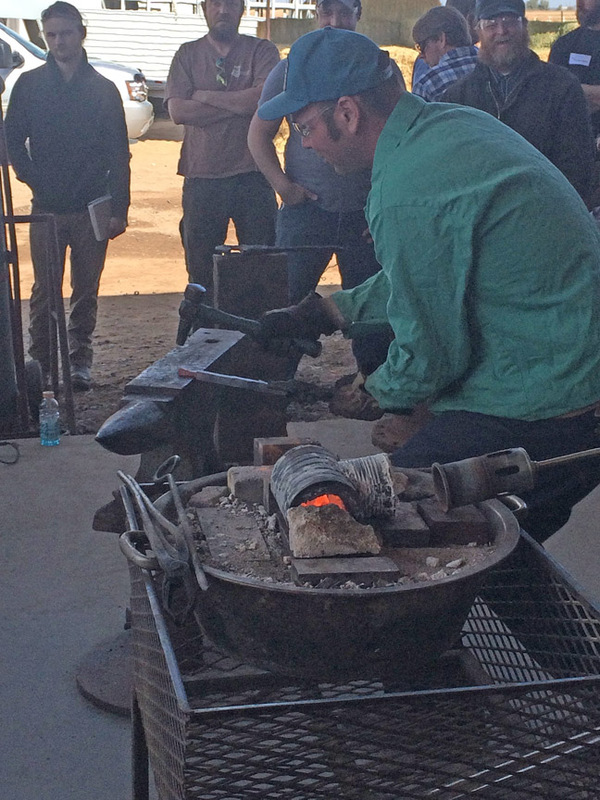 It was a blast to see what a fine knife you can create out of such a small piece of steel. Later that day, before dinner, we shared some of the knives we had both been creating, did lots of test cutting with a new geometry on a chef knife I created at the Wuertz shop, and cooked some more, cut some, talked plenty and enjoyed life to the fullest, right in his desert oasis with family and fire. We wild-harvested Ephedra to add to the ginger tea I was already preparing, created a tincture out of creosote to make incense, and played with tree saps, sage and other desert aromatics to burn by the fire...so much fun! 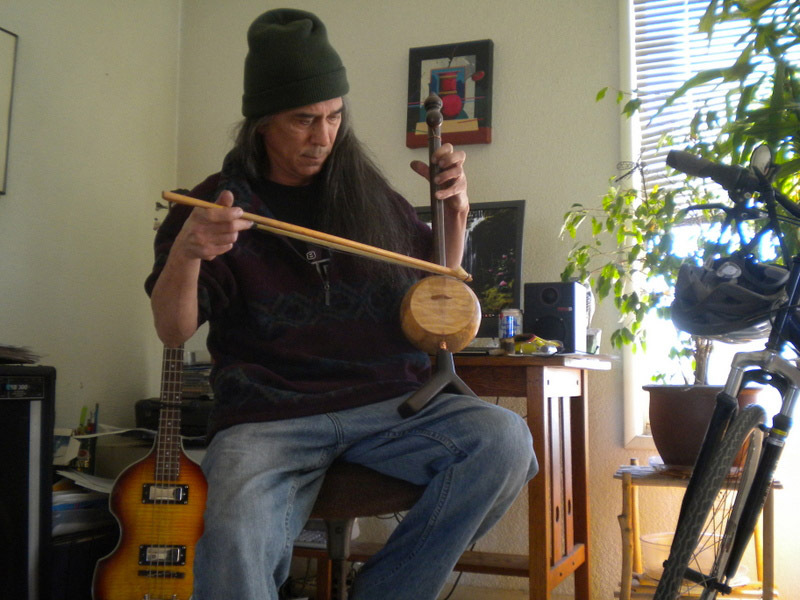 We even played some music, Tai on his Ektara, that he made out of a gourd from...you guessed it.... The Wuertz Family Gourd Farm, and me on my Native American Flute. Many fires were shared at night over those days, started with a weed-burner (the same one he uses to run the little coffee-can-forge) because the rain had really soaked-in to the desert in a beautiful way, including the wood we gathered to burn. This trip is best experienced in the image below....I could write volumes about it, but as they say, a picture is worth a thousand words....and in this case, lots of pictures! Enjoy & be sure to continue-on to see the second part of my Arizona Journey. It was so gratifying to spend time with Tai, and to truly sink into the desert-vibe, I felt that a return trip would happen sooner than later...... Well..... as it ended-up, it was sooner. 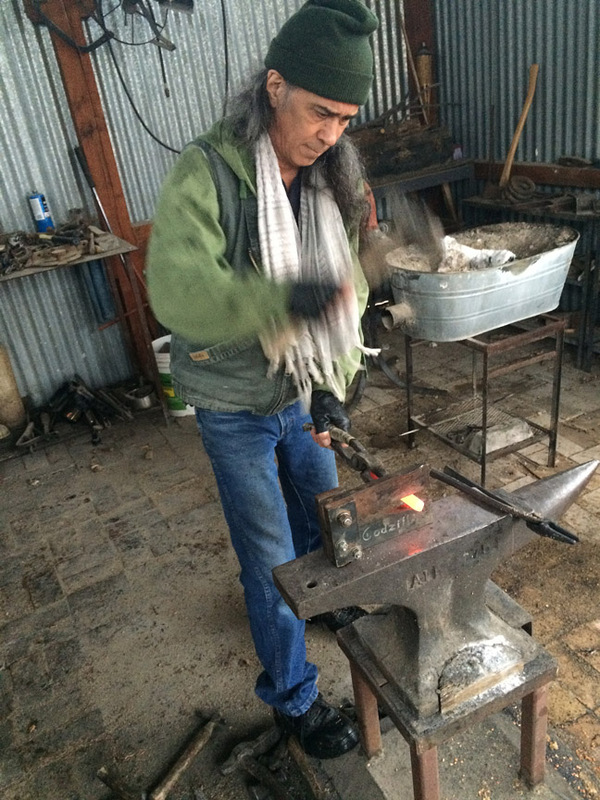 Tai proposed that I assist him in doing a team demonstration at the Wuertz Hammer-In at the end of Feb. where we would demo how to forge a "Bush-Bug". I said YES! So we proposed this to Travis, who gave us the thumbs-up, and it was ON ! The Wuertz Hammer-In is a fantastic and really mellow event with some of the best knifemakers and bladesmiths presenting. I consider myself really blessed to be considered as one of them. The line-up of teachers consisted of Owen Wood, Mike Quesenberry, Tim Hancock, Travis Wuertz, Tai Goo and myself, and a few others that jumped-in to so some fine presentations. 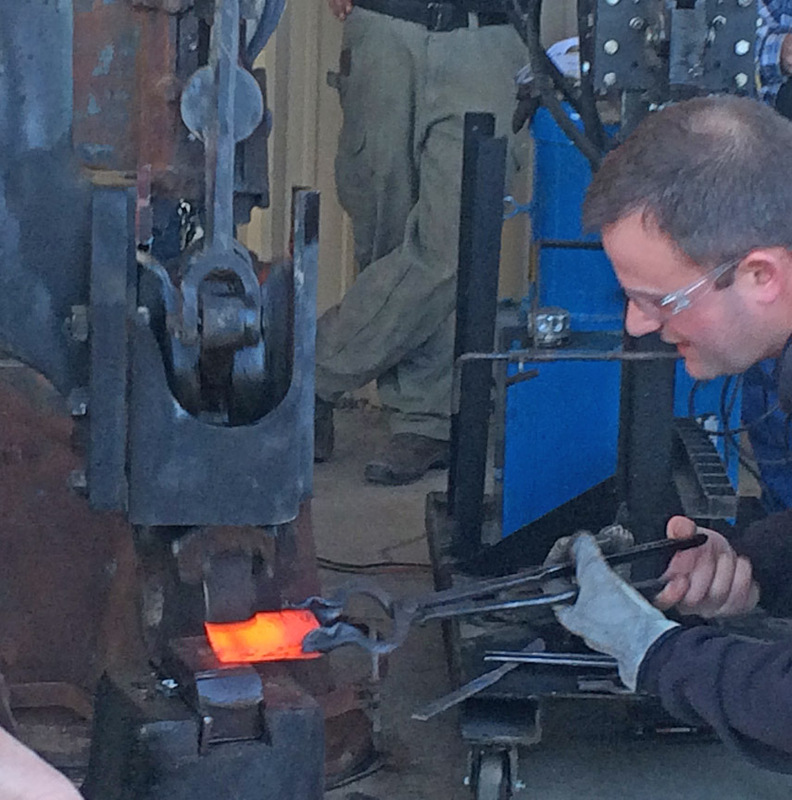 There was fun with live sword, forging damascus, hawk forging demonstrations & much more. 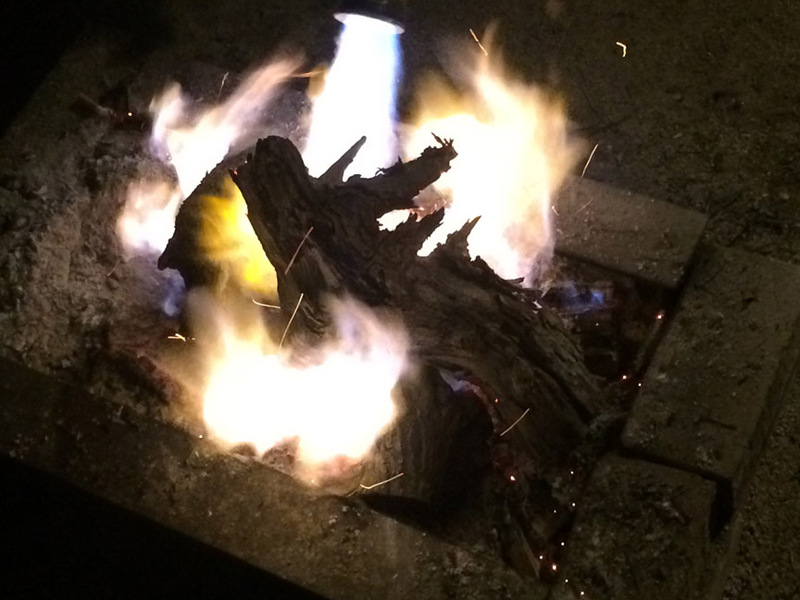 It was a great time for Tai and I to reconnect again and enjoy camping and more fun by the fire. Overall, it was a BLAST! Again, pictures are worth a thousand words. Thanks for taking the time, taking the journey, and for letting me share some of what makes my life as a Bladesmith really gratifying! 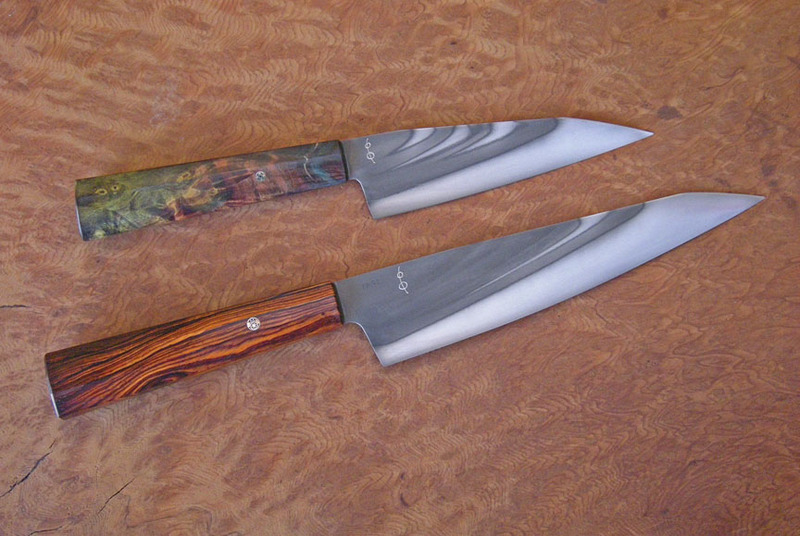 Getting into the flow again, getting some knives done & shipped out to customers. The top Camp/Kitchen FTTU is for a new member to the USN. This one is CPM154 with rustic flats and Stabilized & Dyed Maple with Antique Ivory Inlay and some grippy carving right where it counts. Joey came by the studio with his lovely wife Charmaine, to surprise her & buy her a knife....pretty risky to say the least, as she had no idea why they were stopping-by. ......mostly because she did not see what she wanted, but liked different parts of different knives. "Can you make that knife, like this, with a purple handle on it?".... I said "It would be my pleasure." 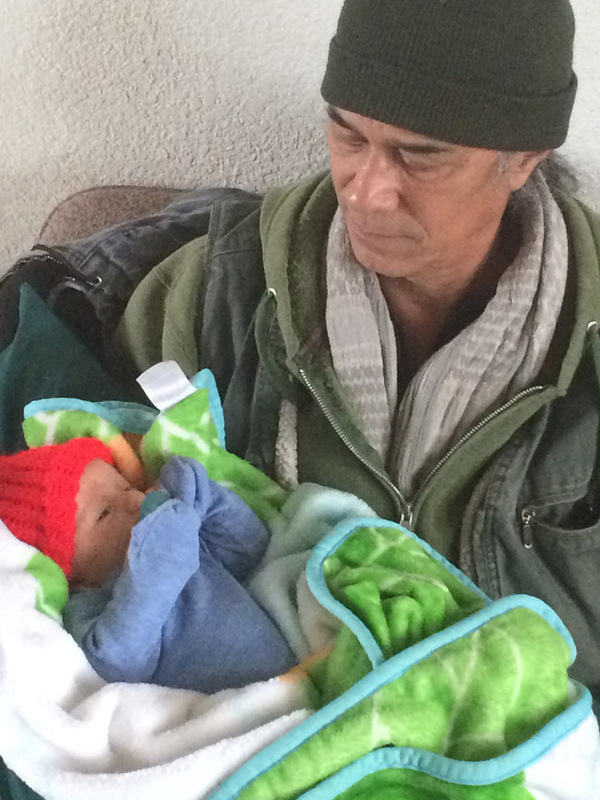 The best part was, meeting them both and feeling like they are family pretty-much within the first few moments of getting to know one another. Again, the USN unites like-minded souls, around knives, friendship and life! 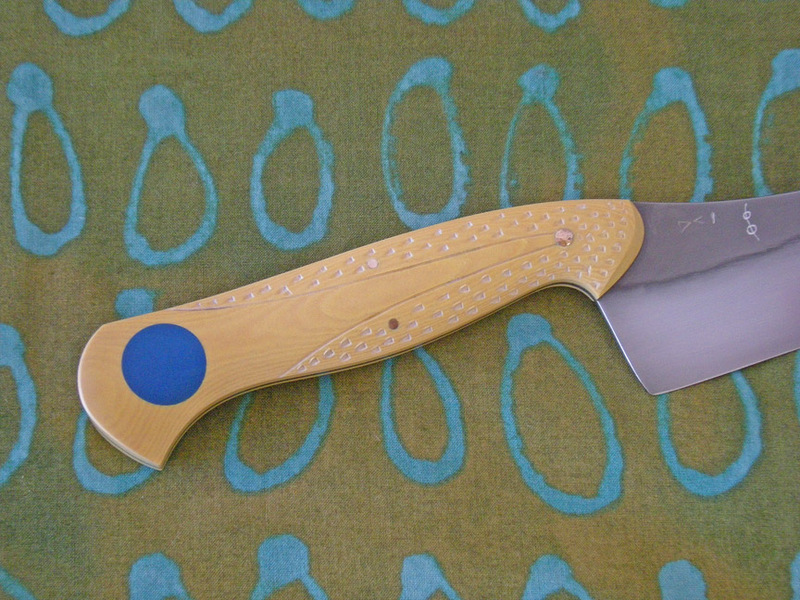 Next is a sweet version of my Classic European French Knife, the first on in CPM154. Exhibiting Antique Ivory Micarta handles with Rare Westinghouse Blue Inlay and detail carving. .............it'll take plenty of Cove Drinks at The Gathering to do that! is one of my Personal Chef Models, with a slightly shorter blade by about .25"
Simply a Very cool knife, and Now Available. 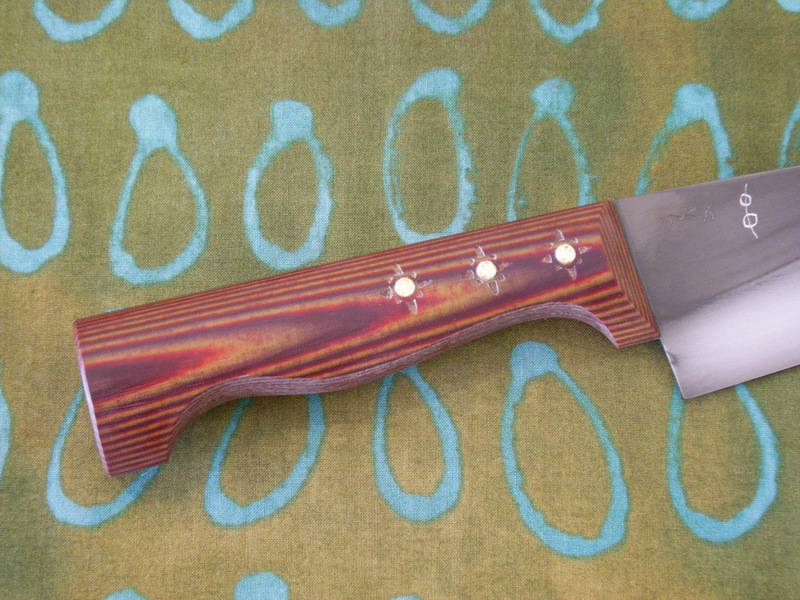 * This one is dressed in some very rare, and seldom seen Burgundy and Ivory Westinghouse Micarta. it's sure to be someones new most favorite kitchen knife for daily cooking! OAl is just under 12" with a 6.75" blade. Just a note...I will continue to post over on Blogspot and also here. I do this because I loke that framework and have a growing history of past posts that would have been too labor intensive to move over here...so enjoy! Best part is I got to meet a really nice guy named Joe Johnston who took images and shot video. ALSO, see that you can scroll through past the video to see more images that Joe took...nice-ones too! 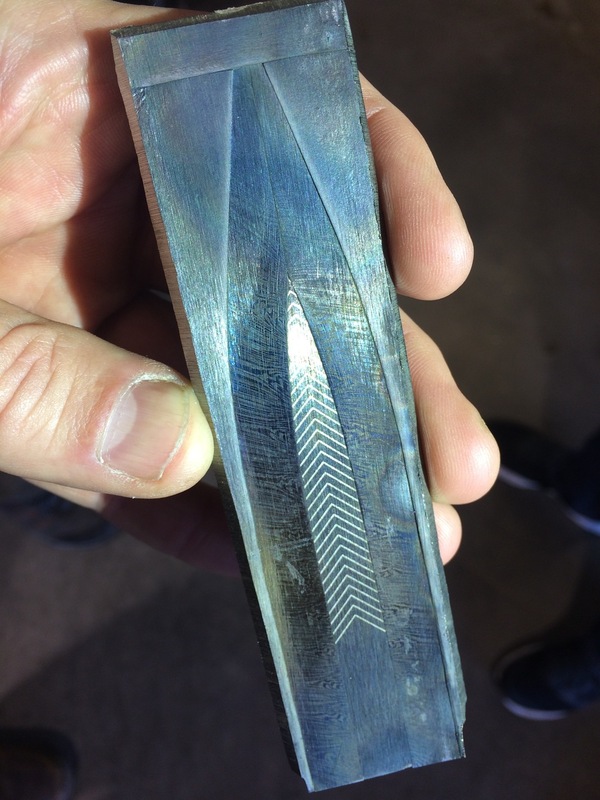 Greetings All, I am so grateful for good friend and purveyor of my knives Duane Weikum of EDC Knives for offering my work at this years BLADE Show Atlanta. I will attend this year but may not be at tie table at all times. Looking forward to seeing you All there! 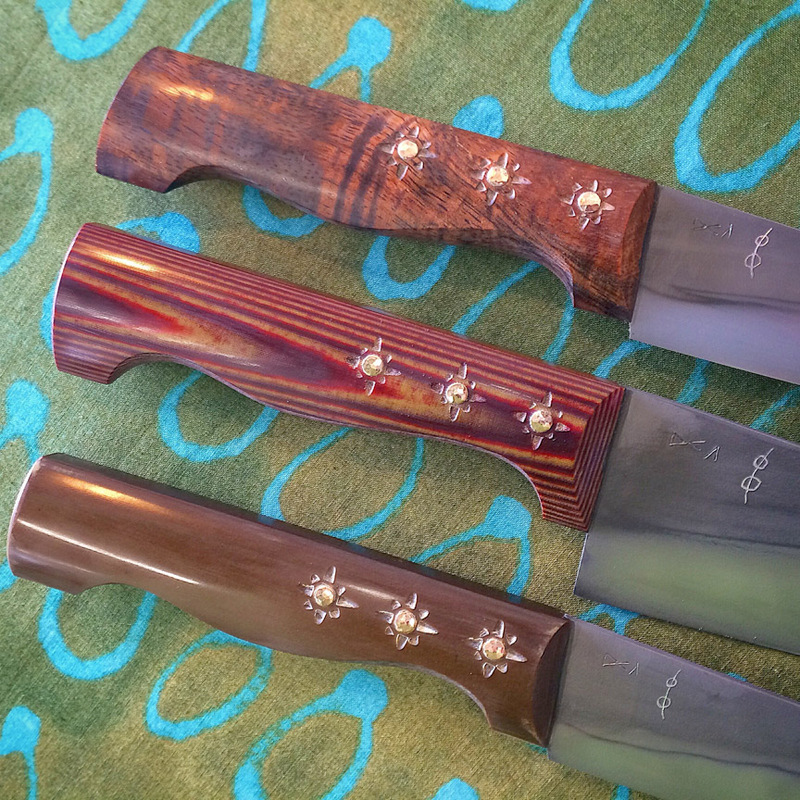 You can visit and purchase any of these knives at table 16C at this years show. 1. A Wonderful EDC Wharny, created out of 1095 with a fine Hamon and polished details & dressed in Vintage Turquoise and Black Micarta with stainless pins and lanyard-liner. This knife come with a custom Kydex Sheath. 2. A Sweet EDC Hunter, created out of 1095 with a fine Hamon and polished details & dressed in green linen Micarta, with Peened bronze pins and stainless lanyard liner. This knife come with a custom Kydex Sheath. 4. 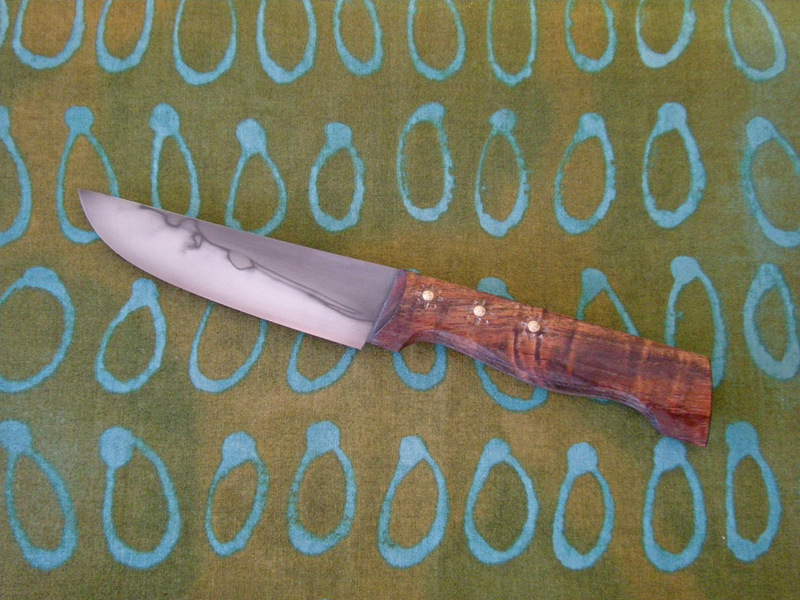 A very sweet Tribal French knife, forged out of 52100 and heat treated for optimal performance. this one with a mortised handle construct of Antique Ivory Micarta with matching inlay at the end of the handle and rosin-impregnated woven cotton line. Just finished this one yesterday and it is AWESOME! Comes with one of my trademark slip sheaths. 5. Last but not least is one of my New Paring/Utility Models dressed in Antique Ivory Micarta with rare Westinghouse Ivorite inlay over a blind pin, kep there with two more peened bronze pins. Comes with one of my trademark slip sheaths. Sitting here in their freshly forged state, descaled and ready for some light stock-reduction and sub-critical thermal-cycles. Stay Tuned as I will be posting more images of the process on these two. I have only made one other like these, and am excited to be making these two now! 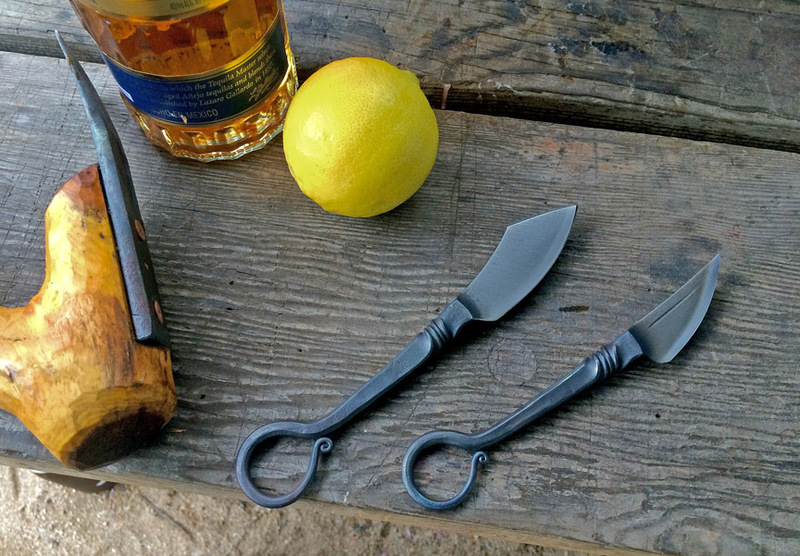 These are perfect compact Camp Knives for general camp tasks, when a large knife is not needed. Well, I thought I would title this Post in this way because of the time and experience it takes to get Exactly what one is after in the realms of the Differential Heat Treatment. 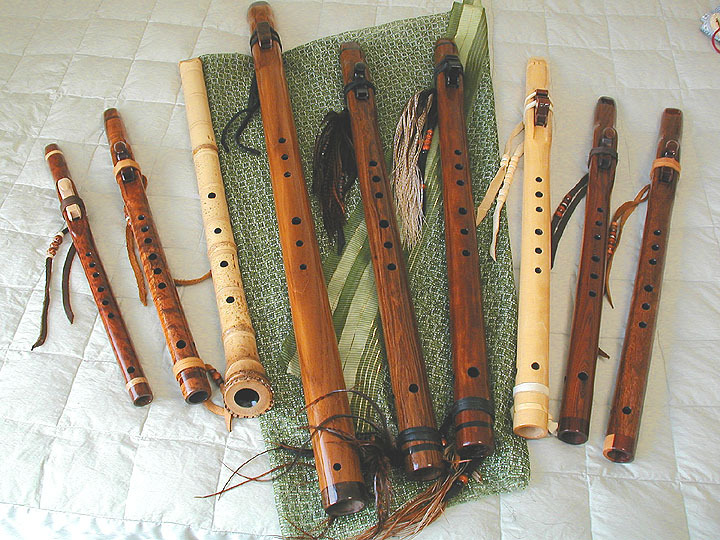 (meaning "Blade Pattern" in Japanese) and there are many many styles of Hamon. What most people do not know, is that shooting for a perfectly defined hamon, or even getting a beautifully defined straight quench right where you would like it, with the exact look you are after, can be quite challenging. This is why you mostly see lots of satin finished knives (especially chef knives) with no etched surfaces.....it's just easier to harden the whole blade. AND is easier to finish too. nothing to really develop, polish, reveal, or fuss-over. I recently finished a knife that I am very proud of and wanted to share it with you All. This is a seemingly simple knife but it really has character. Character you might ask, what's so special? For-One: The position and depth of the quench line is very nice on this particular blade. Of course it could be deeper (higher to the spine) resulting on more hard-zone, but in terms of aesthetics, I like how the quench-line lays half way between the machi and the heel, and flows so gracefully right where the kissaki make it's transition to the spine. Also: The definition is very crisp, and the little bit of secondary plunge as the second ticked during the hardening stage, resulted in a bit of what my Mentor Tai Goo calls "Rainbow Quench". Resulting in what In think is one of the most beautiful blades I have made to date. This particular model is based on my Personal Chef Model, in a stick-tang configuration and with a rustic forged finish, with polished bevels and details for a striking contrast. The Steel is 1095. The blade is 7.25" of cutting edge and the OAL is 13" The handle is African Blackwood with Antique Ivory Micarta inlay and mosaic pin. I also attached a few process images of another knife I am extremely proud of that illustrates the Hamon Process in just a few images. #1 the final part of the clay application. #2 the initial trial etch. Trust me, it's not as simple as 1,2,3 either! I was very happy with in terms of getting the definition of the Hamon just as I wished. It seems as though I got about 90% of what I was after in terms of how I applied the clay on this one! It's just not one of those things that happens in a perfectionistic way, but it is driven by perfectionism and fueled by some degree of program, related to how the clay is applied. .......because the next step is all about time and temperature. Thanks for reading and I hope you enjoyed seeing these two knives that illustrate two styles of differential Heat treatments.